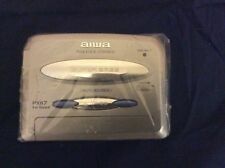 For sale an Aiwa HS-P75 stereo cassette player. Features of the player include:- norm/D. VINTAGE AIWA HS-G35 MKII PERSONAL WALKMAN CASSETTE PLAYER LIMITED EDITION GOLD ! PLAYER 100% Working. Includes Original Headphones - FAULTY - No sound on right side. A boxed, near new Aiwa HS-TX520 personal walkman. In clean, fully working condition. In excellent to near mint condition. Ideal for use. A great collectible set. A highly collectible item. Great addition to your collection. 1980s Music Player. Model no PX 117. takes 2 AA batteries to operate. AIWA HS-JX30 Cassette Recorder. - AM/FM/TV Radio Cassette Recorder. Made in Japan. - Blank skip. - Music Sensor. The sound from the headphones is not very clear. Tape and radio are working. One of the most rare aiwa Walkman from 1983. CASSETTE PLAYER IS NOT WORKING. Aiwa TX356 Digital Screen Stereo Radio Cassette Player walkman. Condition is Used. Full working order, No battery cover. Dispatched with Royal Mail 1st Class. As per pictures in working condition. aiwa TA144 personal cassette player radio . Condition is used Dispatched with Royal Mail 2nd Class. Good condition. In original box. For sale a Aiwa HS-P1 Stereo Cassette Player. In good condition as shown in pictures. 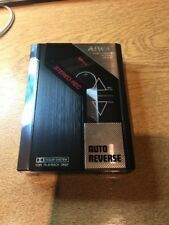 Aiwa TX476 Personal Cassette Player retro kitch walkman. Condition is working. Dispatched with eBay delivery – Shutl 2-3 days. Tested and Fully Working. Tested and fully working without any issues. Minor wear and tear. Plays very well with no WOW flutter, the playback is nice and clear. Fully working and tested. Just the Walkman no headphones or any other accessories. For sale an Aiwa Personal Stereo Cassette Player HS-PX820 Accessories. That said it is fully functioning sounding great and supplied with original Aiwa accessories! Retro bit of kit with accessories. AIWA HS-GS352 AND TX416 PERSONAL STEREO CASSETTE PLAYER WALKMAN. Good Condition and fully functional Got videos of them working on dropbox. Dispatched with Royal Mail 2nd Class. Hi, up for grab is a Walkman Cassette player by Aiwa from Japan. secure a piece of music history from the 80s. will suit serious collector. This is a rare unit with all function tested and working as it should. AIWA HS-GS272 stereo cassette player. Tested and working. AIWA PERSONAL CASSETTE TAPE C90 PLAYER. Cassette Format: Compact cassette. It is a portable handheld device that plays standard audio/music cassette tapes. Cassette Player: Yes. Cassette: yes. Cassette Deck: yes. Hi this cassette player is in excellent working condition. you will receive just the cassette player (NO BATTERIES OR EARPHONES ). All the buttons are functioning and working. The Super Bass button gets stuck and doesn't get all the way to the side. This player is working fine, however bass button doesn't go all the way across and gets stuck in the middle! AIWA TA 163 STEREO RADIO CASSETTE PLAYER. IT SAYS A LOT ABOUT THEIR TALENTS, IF ANY. WILL BE REPORTED TO AUTHORITIES. FRAUDSTERS/CRIMINALS BE WARNED YOU. Walkman cassette player NEW BELTS FOAMS CLEANED WORKING & TESTED! AND 3 SETS OF FOAMS. As a huge fan and collector of Walkman's since the early 80`s. YOU'RE BUYING FROM A VETERAN WALKMAN COLLECTOR. FOR MORE GREAT WALKMAN'S. CASSETTE PLAYER. LLY WORKING - CLEANED - TESTED - NEW BELTS!